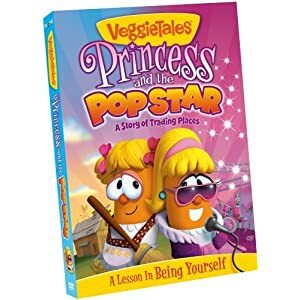 The latest installment of Veggie Tales is The Princess and the Popstar. My kids think that Bob the Tomato and Larry the Cucumber are hilarious, along with all their other veggie friends, so they were more than happy to check out The Princess and the Popstar. There have been many adaptations of Mark Twain's The Prince and The Pauper, starring everyone from Mickey Mouse to Barbie to the Olsen twins to Jodie Foster (Freaky Friday) to Kevin Kline (Dave). This one is perfect for toddlers and preschoolers, especially little girls (there's an awful lot of pink). The songs are funny and catchy, and the antics will have your little one smiling and laughing throughout. I love the humorous references to pop culture and the moral lesson about appreciating the life you've been given. I would have loved it even more without the references to God, but that's what this series is known for, so if you're not down with the Christian-centric morality, you'll have to find another DVD to watch. To celebrate the release of the new VeggieTales movie, one lucky Bonggamom Finds reader will win a copy of VeggieTales: The Princess and the Pop Star! Leave a comment on this post and tell me your favorite Veggie Tales character. 1) Add the Bonggamom Finds blog button to your sidebar (1 entry). This giveaway ends at 11:59PM PST on August 25, 2011; I will draw a winner at random on August 26 and post their name after he/she confirms acceptance. Continental US residents only. For additional giveaway rules, click here. Good luck! My favorite is Junior Asparagus. Thanks. I like Bob mostly because I like the name Bob. It makes me giggle. Lol. I love Bob, but I think my son likes both Bob and Larry a lot! We like Larry the Cucumber. Bob is a close second. Congratulations to the winner: #14, lewalk!